STEM education is sweeping the nation. From robotics competitions to coding games, school districts are scrambling to provide STEM programs while teachers sift through thousands of Pinterest pins in search of quality activities. As a STEM Director, I am always looking for new curriculum ideas, but my biggest frustration is the wide-range of activities that are labeled "STEM." Building a tower from spaghetti and tape is categorized the same as programming a Lego Mindstorm to navigate a maze. One project takes 10 minutes while the other requires weeks of critical thinking and learning a programming language. We need further clarification to distinguish these levels in STEM education. To help guide educators and administrators in the implementation of curriculum and development of programs, we propose the following 3 stages of STEM Education. From building the tallest tower of index cards to flying a paper airplane, stage one STEM challenges are the most basic activities. These challenges do not have an obvious connection to math and science concepts and at first may seem like superficial activities. However, they are important primary activities that serve to build a foundation of skills in problem solving, teamwork, communication, and grit. Pinterest is filled with Stage 1 STEM Challenges with the most popular being the tower challenges. During our afterschool STEM program, we use simple STEM challenges as icebreakers. Our favorite is the pipecleaner tower challenge, described in further detail here. Students work in teams to build the tallest tower, and through this challenge, they learn how to work in a group, discover communication solutions, effectively use the materials, and persevere despite difficulties and failure. 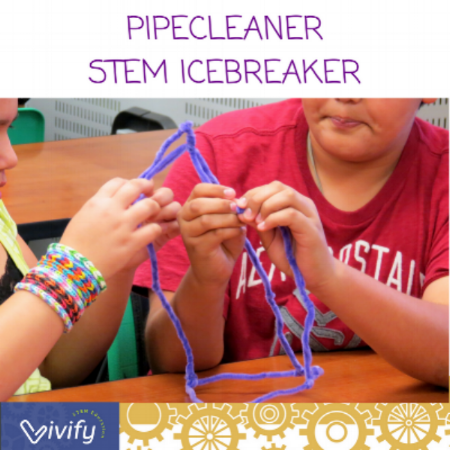 You can find more icebreaker STEM challenges here. In stage 2, students apply math and science concepts to problems using the engineering design process. Instead of immediately building, students are systematically guided through a process of brainstorming, design, building, testing, re-design, and sharing their solutions. Our most popular product, the catapult challenge (found here), is a great example of this stage. Students apply knowledge of elastic potential energy to design a catapult device to either hit a target or maximize distance. During the testing phase, students analyze catapult designs through graphing results, averaging data, and comparing results of different launch angles. This process enhances student critical thinking skills while integrating math and science skills into an engaging hands-on engineering project. Real-world connections further enhance curriculum -- including discussion of engineering careers, connection to real-life catapults used on aircraft carriers, and historical catapults in warfare. Important note: many popular challenges circulating online do not have the rigor of Stage 2 STEM, including a math and science connection. Promoting only Stage 1 activities can quickly lead STEM to be dismissed as superficial and unnecessary. However, many teachers complain of a lack of quality STEM curriculum, and we are slowly trying to fill this gap along with other motivated educators. We believe that most classroom STEM activities should fall into Stage 2. Teachers and curriculum writers should commit to connecting STEM activities to relevant math and science standards and properly guide students through the entire engineering design process. Robotics competitions have taken over the education world! Stage 3 STEM involves long-term projects such as FLL robotics where math and science concepts are applied to solve open-ended problems using the engineering design process. Students should have successfully completed Stage 1 and 2 projects to build a foundation of skills and understanding of the engineering design process. Stage 3 challenges students to dive deeply into a problem, rigorously apply the engineering design process, learn new technology, and present results. Another example of a design competition is the Mars Colony Competition that our Space Club organizes each year. Students are challenged with designing a long-term human habitat on Mars to keep humans happy and healthy. Students research the atmosphere of Mars, learn about community planning, and design engineering and mental health solutions. They answer questions like: How will your colony survive a dust storm? How will you entertain colonists for a long mission on Mars? The final product includes a prototype that is presented to STEM professionals for judging. You can find the complete instructions, rubric, and student handouts for this project here. Updated March 2019: Do your students struggle with research? We now have a Mission to Mars game to help your students learn about Mars and NASA technologies! Game cards guide them in debating which solutions are best for keeping humans alive and happy. Our students LOVE this game! Check it out here. A successful year-long STEM program should guide students from Stage 1 to Stage 3 STEM challenges to build a foundation of skills and confidence. An awareness of the distinct stages of STEM allows for teachers to easily incorporate Stage 1 activities into their classroom knowing that it isn't expected or even recommended to start with Stage 2 or 3 STEM challenges. Often, teachers assume a STEM activity must include very technically challenging skills such as programming or electrical engineering, and they are afraid to have anything to do with STEM. We challenge all teachers to incorporate some level of STEM into their curriculum! A note about career connection: At Vivify, we believe that all STEM challenges should incorporate STEM career connections and present problems based on real-world scenarios. Students then become excited about STEM pathways and are inspired to pursue STEM careers, thus fulfilling an important goal of STEM education. The stages of STEM is a new topic of discussion, so below we have created an infographic to aid in your journey through the STEM stages. We would love to hear any comments you have below!